Procure-to-pay — also referred to as purchase-to-pay — is a system designed to support the end-to-end procurement process. This includes the the initial decision to procure goods or services, the process of selecting the goods or services, and the transaction to pay for said goods or services. 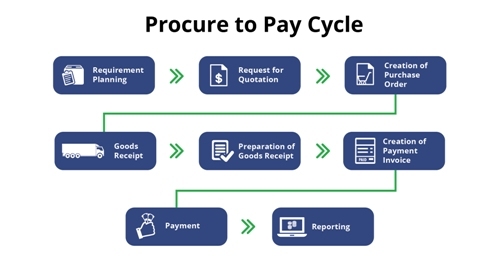 The procure-to-pay cycle integrates the Purchasing department and Accounts Payable department of a business or organization, allowing for the seamless procurement and payment of any goods and services. Requirement identification: A need for a good or service is identified by an employee or department in a business or organization. Purchase Requisition authorization: A request to purchase a good or service is opened; it will be approved or denied based on factors like the type of request, cost, and allowed budget. Purchase Requisition approval: Once the purchase requisition is reviewed, it is often sent for final approval by the inventory controller. Procurement: The approved purchase requisition is sent to procurement; this department can identify if there are existing vendors that can supply the goods or service, or if a new supplier will be needed. Supplier identification: Procurement/the buyer researches potential suppliers (only for new vendors). Inquiries: Once potential suppliers are identified, the request for proposal (RFP) — also known as a quote — is requested. Quotes/negotiation: Potential suppliers send back quotes for the cost of goods or services; short-listed suppliers are invited to negotiate for the best possible contract or terms. Vendor selection: After negotiations are complete, a vendor is awarded the contract to provide goods or services. Purchase Order acknowledgement: A purchase order, an official communication of intent to order goods or services, is sent by the buyer to the supplier. Receipt of goods: The supplier sends the goods or services to the business or organization; the receiving staff will check the delivery against the PO originally submitted. Invoice submission: Accounts payable will record the invoice into the Accounts Payable system. Invoice matching: The invoice will be matched against the purchase order (PO), invoice, and delivery documents (i.e. packing slips); this is a 3-way matching system. Payment to supplier: Once the invoice passes the matching system, payment is released to the supplier or vendor. Procure-to-pay cycles can be streamlined using IT solutions. Such solutions can include an e-procurement service (that can include e-requisitioning, approval workflow, and electronic inventory management), scan-and-capture service, supplier portal that enables electronic invoice submission, and purchase order to invoice matching and processing for invoices. Procure-to-pay has significant impact across the business or organization since it touches multiple departments like purchase, production, and accounting. Every business or organization needs to run procure-to-pay cycles to continuously manage their cash flow, build goodwill with suppliers, and make profits.